Markets had been falling all the previous week, and today was another huge down, where significantly, the SPX having lost nearly 7% last week, fell a further 3.26%, and entered a bear market, defined as a 20% drop, for the first time since 2008. The high of Oct 3 was 2940.91 and so 20% below this is 2352.32. The market closed at its low of 2351. Other markets followed suit, but of course DAX and FTSE have been over 20% off the highs for some time. Sentiment was not helped by the government shutdown. The one market that didn’t plunge was FTSE, which closed at 1300, (before New York even opened) was actually up 0.52% on the day. Unlike DAX and NKY, FTSE futures also closed then. DXY fell in line with equities, and was 0.35% down on the day. As you might expect JPY was sharply up, but so was GBP, which added 0.73% in two hours as at US opened. EUR, AUD and Gold were also up, but CAD was dragged down by Oil which fell 6.5% to a equal the 18-month low of June 2017. Yields were down 6bp in line with the dollar and the risk off mood. Today was the start of the short Santa Rally, as defined in Jeffrey Hirsch’s Stock Market Almanac, and what a rally it was. After the S&P/Case-Shiller Home Prices beat at 14:00, DJIA rose by over 1,000 points, the first time ever in history. PX gapped up and closed at its high, 4.96% up to close at 2485, which is where it stood the previous Wednesday. DAX and NKY performed similarly, but FTSE (including futures) was closed. Although this may have been the ‘spirit of Christmas’, a more likely explanation is the 9.7% increase in the Oil price, as it bounced off the (Monday, and November 2016 and June 2017) triple low to add 9.71%, its best day since Feb 22, 2016. 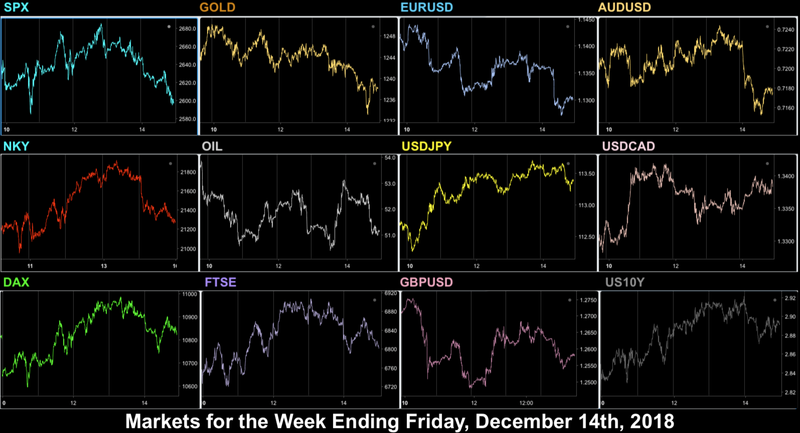 The ‘Turnaround Wednesday’ (ie would have been Tuesday but for Christmas) extended to the dollar, with DXY adding 0.47%, and in an exact reversal, GBP, EUR, Gold and particularly JPY were sharply down, whereas CAD was up. Only AUD kept direction, and added for the day. Yields also reversed back up in line with the mood. The over-enthusiasm was tempered on Thursday. After a mixed Jobless Claims report at 13:30, and no progress on the shutdown, SPX and other indices pared their gains, all pulling back, but still ahead of the Monday close, and then rallying sharply into the US close. This was timing, SPX ended green, but the foreign indices, being futures at that time didn’t quite hold all Wednesday’s gains. FTSE had closed before the US session even opened on Monday, and missed the Wednesday rally. It plunged over 2.6% to a new two-and-a-half year low, before recovering over half that loss in futures. the late US session. FTSE cash close 2% down on the day. There were, in hindsight, some arbitrage possibilities on this index as it tried to catch up. The dollar turned back down, with DXY softening by 0.45%, but again the picture was mixed, JPY and Gold were up as equities turned down, the former giving up over half its gain into the equity closing rally. EUR was well up, but GBP, which had swung over 1 cent earlier in the week was relatively flat. As Oil retreated from its stellar one-day gain, CAD followed it down, and yields gave up most of their Wednesday spike, in line as on Monday. The correlations have been strong this week, the USDJPY and US10Y charts look very much like the one for SPX. After a wildly volatile week, Friday was much flatter. SPX and NKY were flat on the day, where the lagging (due to market time differences) European indices posted solid green candles. It is a sign of the current volatility that the relatively small moves on the charts were still 1.26% up for DAX, and 1.01% for FTSE, in normal markets, a big ramp. This was despite a notable miss in German CPI (1.7% vs 1.9% est) at 1300, which notably capped the rising EUR, which stopped rising at that point, unlike JPY, GBP and Gold which carried on rising all day. AUD and CAD had early rallies, but the EIA Stock miss at 1530 (two days late because of the holiday), and consequent fade in the Oil price sent the latter into reverse, to be the only currency weaker than the dollar this week. Yields were down again, to close the week at 2.718%, an 11-month low. 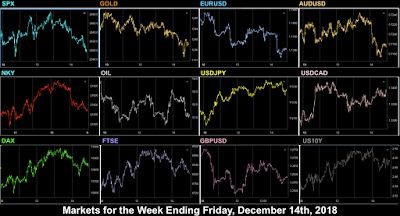 After the disastrous crash into Christmas Eve, the market did produce a Santa Rally, and indices ended the week slightly up. DJI made its first ever 1,000 point up day on Dec 26. The US outperformed other countries, but this may have been because they had more closed days. We are of course still well down on the month. DXY gave up 0.49%, exactly the same amount as last week. Forex was much flatter than usual, but the biggest winner JPY is an indicator the market is still nervous. CADJPY was the only pair to move more than 1%. NDX immensely outperformed SPX. The tech index was up 4.86%, and AMZNs move was outstanding. Of great note this week was the recovery of Ethereum, which has put on 66% in the last two weeks, its best since March 2017, long before the crypto bubble burst. Between railing at the Democrats about the shutdown, President Trump tweeted over the weekend that he spoke again to President Xi of China and [the trade] “deal is moving along very well” and “Big progress being made!”. Previous tweets in this vein have lifted the market. New Year’s Eve falls on a Monday, as it did in 2012, 2007 and 2001. Traditionally this is the last day of the Santa Rally, and also of course the last day of the fiscal month, quarter and year, where any last-minute window-dressing (rotation of stocks to make fund holdings look good) takes place. However, it’s another pre-holiday, so expect lighter trading and surprises are less likely. The stock market is open all day, but the bond market closes at 1900. There is little news. New Year's Day and all markets are closed, so a bigger break than Christmas. Futures will open at 6pm EDT. The only news is from Australia, where it is of course Wednesday morning. Markets return today for the first day of trading in 2019, (except for Japan and New Zealand which remain closed a second day), although news is just a constant stream of Manufacturing PMIs. Traditionally it is an up day as institutions start buying for the new reporting year, but in this market, who knows. In theory, it is the start of earnings season, and 69 companies report, although the first reports on consequence are JPM. WFC and UNH on Jan 15. The ISM PMI is the most important print of the day, and it is expected to decline, although last month’s print beat substantially. A similar decline (est 58, prev 60.7) is expected in the ISM Prices Paid report. The ADP jobs report is always watched to give an indication of Friday’s NFP. Like last week, the API oil report is two days late due to the holidays. Japan is closed for a third day. The biggest day of the week sees NFP, where estimates are a little lower than usual. We have this issue where markets are entering bear territory, yet US economic figures are quite good, and the Fed only works from the latter, despite recent strong pressure from the White House. An NFP beat has a strong chance of being taken as “good news is bad news” (and a miss vice versa), meaning it will confirm or delay rate hikes. Added to that Chair Powell joins a panel in Atlanta with previous Fed Chairs Yellen and Bernanke today. What he says will be watched very closely. Also on today are Fed members Mester at 1300 and Barkin at 1830. Like last week, the EIA report is two days late due to the holidays. Japan’s markets open for 2019. Unusually, there are Saturday speakers this week, Fed Williams at 1300 and Bostic at 1515. The rout from last week continued unabated today, with all indices down, for the usual reasons (trade war, bond yield inversion curve, falling oil) and a new one, the Fed on Wednesday, with SPX down 2.1%, hitting a new 13-month low. All three major indices are in correction territory (over 10% down from the last high) and the small-cap Russell is in bear territory (over 20% down), as is DAX, although FTSE and NKY are not there yet. DXY was down 0.3% from the 16-month high reached on Friday, after the Empire State business index hi a 19-month low. All currencies (and Gold) advanced, except for risk currency AUD, which was flat and oil proxy CAD which retreated as Oil fell 3.8% in line with general sentiment. (Business requires transport, transport requires Oil. Effectively Dow theory taken one step further). 10-year note yields were down 4bp, either in line with USD or because of stock to bond rotation, take your pick. Markets were down again today although the action was less severe, and SPX ended the flat (giving up pre-market/futures gains). Other indices were similarly down, for the same reasons as yesterday. 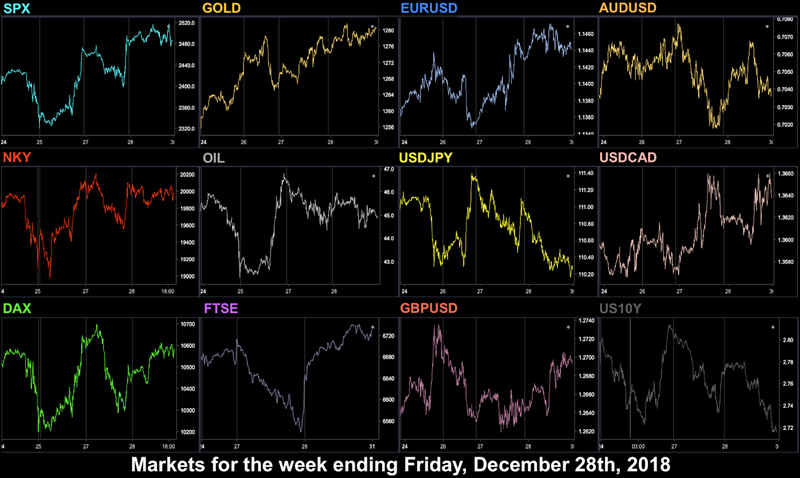 It was similar for the dollar, a quieter day than Monday, but in the same direction. DXY was down 0.15%, Once again, CAD followed Oil down (Oil lost 6.65%, its worst day for four weeks) and AUD was flat. Yields were three more basis points down, and the 2/10 curve actually widened to its highest level for two weeks. Today was the day everyone had been waiting for, and the Fed duly hiked by 25bp to 2.5%. Fed Chair Powell made some dovish remarks, but not dovish enough for the markets. He explicitly rejected [President Trump’s] political interference, confirmed the Fed was economic data (and by implication not equity pricing) driven, and suggested two rate rises (not three) next year. Equity markets nosedived immediately. DJIA which had put on 410 (1.7%) points before the release at 1900 instantly plunged 455 points (1.89%). After recovering half of that, the 1930 press conference caused a further collapse, and by 2000, the index was 900 points (3.74%) lower. Foreign markets followed suit across the board. DXY, which had been falling all day, spiked up 0.5% on the rate release, but not immediately, which meant it finished the day flat. EUR was flat. Other currencies and Gold fell. The yellow metal initially ramped as a response to the equity drop, then fell sharply in line with USD. As you know from previous reports, Gold’s risk off reaction these days is weaker than its reaction to USD moves. CAD made an early recovery but fell again after the CPI miss at 1330. Notably AUD and NZD were particularly weak, with the latter falling further after the GDP miss at 2245. JPY rose on risk off, matching USD and the pair ended flat by the close. Yields fell sharply in line paying more attention to equities (rotation) than USD, as the latter’s move was less severe. Oil rebounded 2.1% today despite the EIA miss at 1530, probably due to entering an oversold (daily RSI(14)<30) condition on Tuesday. There was no let up as Asian and European markets digested the Fed message, and equities fell again, with SPX down another 1.6% and NDX briefly slipping into bear territory (off the high by 20%). China and tariffs were hardly mentioned in the news, and we are possibly seeing a political narrative that this correction is entirely the Fed’s fault. Certainly President Trump thinks so and he controls the agenda. The issue of course is that the Fed’s dual mandate is employment and inflation, not equity prices. Perhaps we might see more of the controversial view that the Fed was responsible for the 1929 crash and Great Depression. DAX, FTSE and NKY moved almost in tandem with SPX, although FTSE futures managed a last minute rally to close slightly up, possibly on the Gold rally, and some relief to retail from the NKE earnings report and beat (which included strong Europe sales). After the initial ramp—which was counterintuitive anyway, as yields fell instantly, and two rate hikes is less than three—markets started selling USD. 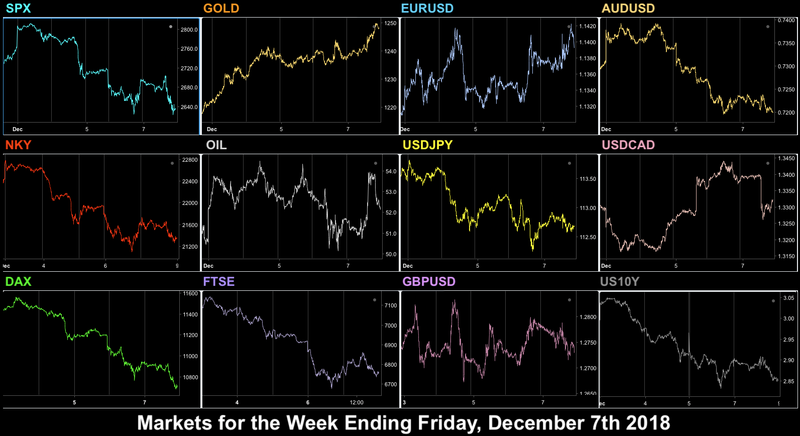 EUR, GBP, JPY and Gold were strongly up, the latter two in a straight line reflecting the strong risk off mood. Gold added $17, and JPY had its strongest day since January, with USDJPY falling 1.06% to touch the 200-day moving average for the first time since August. The GBP 9-0 rate hold was widely expected, and erased a 0.6% ramp after the very strong (core 3.8% vs 2.3%) UK Retail Sales beat at 0930. However, the USD weakness dragged the pound back up. Even AUD and CAD briefly rose, although these commodity currencies ended down on the day. In a rare move, SEK (4.2% of DXY) advanced 1.4% after the world’s oldest central bank surprised with 25bp rate hike. Even MXN added 1.2%. DXY had shed 0.61% by the close and so was well below the rate hike level. Yields had been flat all day but had a late 2bp spurt to return to the pre-Fed level. Government shutdown day came and went without resolution, and at the time of writing, funding for many parts of government expired midnight Friday/Saturday and Congress is in session over the weekend to work out a deal. This bizarre quirk of US politics rarely affects the market, as it is quickly resolved, and of course many Federal employees will have taken next week off. We now have a Democrat house but they have (surprisingly) passed Trump’s wall-funding bill, only the Senate remain. Markets drifted in Asia/Europe and then there was a brief but notable rally in the early US session after Fed Williams (hawkish, 2018 and 2019 voter) made a conciliatory speech saying that “The markets are telling us [the Fed] something pretty clearly — that there are at least downside risks that we need to be attuned to”, and that “material” deterioration in the outlook would cause them to reconsider rate hike policy. He added “We are going to go into the new year with eyes wide open, willing to read the data, listen to what we are hearing, reassess our economic outlook and take the right policy decisions that will keep the economy strong, keep the expansion going, and keep inflation near 2 per cent.” DJIA shot up 250 points in minutes, but the rally was short-lived. From that high point, the index then fell and fell, down 860 points (3.7%) to close at a 14-month low. It was of course quad witching day, when daily, weekly, monthly and quarterly options all expire together. Calls would largely expire worthless and therefore not be exercised. Other the other hand, any puts where shares had been bought to cover would push the market further down. Note that total volume on Friday, at 12 billion shares, was the largest in two years. At this point, the equity markets have had their worst December since 1931. Even if a post-Christmas Santa Rally appears in the four remaining trading days of the year (three and two halves), SPX would have to add 178 handles (7.36%) to even beat 2002 where the bear market at the time was in its final throes. In currencies, USD rose back up today, with DXY adding 0.58% to end up where it was o Wednesday. Once again, given the risk off, JPY kept pace and ended flat. Other currencies all softened, and again AUD and CAD were hit worst, as Oil gave up another 1.2%, and although Canada beat on GDP, they missed on Retail Sales, both at 1330. Yields were more or less flat. The 2/10 yield curve stabilised this week, but still ended 1bp closer at 14.9bp after dipping below 9bp last week. The 5/3 went positive again this week, and only the 3/2 is still negative. The worst week for SPX and NDX (down 7.98%) since the Euro crisis in August 2011, and the worst three weeks since the 2008 crisis saw VIX hit its highest level since February. NKY was nearly as bad, although notably other indices did better, showing this was a reaction to the rate hike rather than tariffs. We will see if there is a Santa Rally next week, but if not, December 2018 is on course to be the worst month for equities in ten years. DXY only softened a modest 0.49%, but this was largely due to a collapse in CAD, following Oil. Risk currency AUD fared worst, and buying EURAUD for 2.63% would have been the best forex trade. Oil was marginally worse than the week ending Nov 24 (when it fell 11.51%). Some FAANGs fell even further than NDX, with AMZN having its worst week since Nov 2008. The only bright spot in this gloomy week was cryptos which surged, but even those stellar percentages meant BTC and ETH were still lower than their position two weeks ago. Obviously a very light week for the holiday. Japan is closed for the Emperor's Birthday, and US markets have a half day. The shutdown may or may not be fixed. The huge volume of Friday’s selloff does not bode well for the markets, although they are, of course, all oversold in technical terms, and it is unlikely there would sufficient volume to make a serious reversal, and there is little economic news to make a difference. Australia, Europe and US are closed for Christmas Day, only Japan is open. Expect a completely flat day. Australia, Europe and Canada are closed for Boxing Day. The US is open, but of course with many traders still on vacation, volume and therefore volatility is expected to be very light. The API report is one day late because of the holiday. 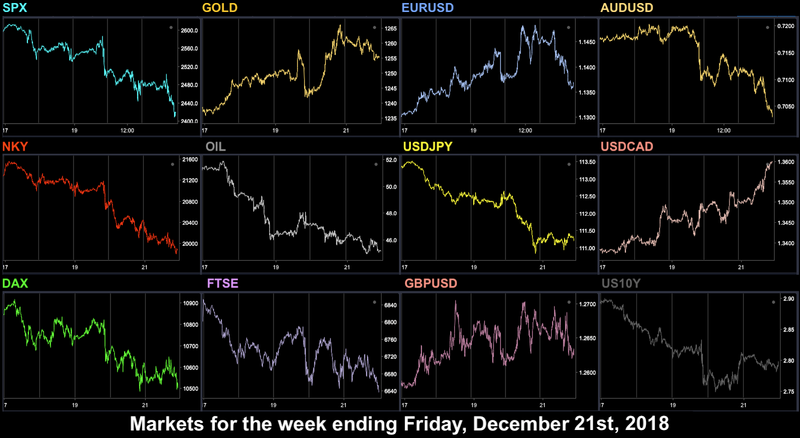 Global trading resumes for this very short week today, but in the absence of much news (and surprises are unlikely, the politicians and central bankers take holidays too), we don’t expect much to happen. There might be a bit of final window-dressing of portfolios today and tomorrow to look right for the fiscal year end. The effect of this is to promote strong stocks (possibly averaging down) and remove weaker ones, which accentuates any positive trend, for example this year it would be defensives vs risk stocks. If XLU goes up and NDX goes down, you will know why. There is a lot of talk about the US having peaked and other markets being stronger at the moment. Again this would be reflected in indices. Look at the relatively unusual movements last year, where DAX fell all week, and FTSE rose in this period. The timing this year is that the final day is on Monday, but the comments above apply to today as well. If you look at the charts for this week last year, you see all kinds of odd movements, where NKY collapsed a day before SPX, and DAX and FTSE went into opposite directions. The EIA Oil report is two days late because of the holidays. Next week is Christmas week, the biggest holiday of the year in the US and Europe, and we wish you a happy one. Nevertheless there is half a week of trading, albeit in low volume. We will report as usual. 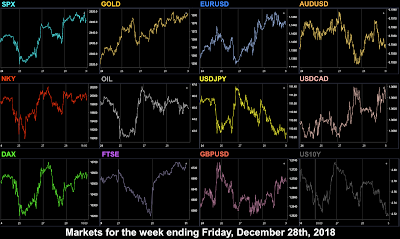 Markets pulled back hesitantly from last week’s low, with SPX and foreign indices posting modest gains. However, there was a sharp slide at the open, led by AAPL on news that China had imposed a ban on most iPhone models, and the recovery came too late for the European cash indices which closed red, only recovering in futures trading after 1630. The dollar was firmly up with DXY adding 0.49%. against all currencies and Gold after the miss on Chinese inflation. Only AUD held its own and closed flat. Oil was down 2.4%. Adding to the woes, the two-year/ten-year US Treasury bond yield narrowed by 1bp as the short-dated paper advanced against a flat 10-year. Equities rallied at the US Open today on hopes that the US-China problems are progressing, with a reduction of Chinese auto tariffs, and a tweet from the President, but mostly evaporated after he threatened a government shutdown (yes it’s that time of year again) over his Mexican wall funding. Nevertheless, all indices posted a slight rise on the day, more so outside the US. DXY was up again, 0.28% today, as GBP hit a fresh 20-month low as the UK parliamentary vote on Brexit was cancelled, and PM May faced a vote of no confidence (despite the average earnings beat at 0930), and EUR was down on reports that the measure proposed to stop French public protests may breach EU rules. Of the major currencies (and Gold, down $2), only AUD was up on the day. Oil had a Turnaround Tuesday, erasing some of Monday’s losses. Ten-year yields rose 2bp, but the 2/10 gap narrowed another 2bp. Volatility by tweet is the defining change of the Trump era, and so it was today. An early missive from the world’s most influential Twitter account suggesting he would intervene in the Huawei case if it helped trade sent markets sharply up, in particular the SOXX ETF (and NDX) which fell sharply last week on the arrest. However, just like the day before, the market sharply gave up most those gains in late US trading, as the confidence vote in UK PM May drew near. Notably the DAX did not pull back, buoyed by news that Italy may be backing down on their illegal budget. The greenback took a breather today, with DXY giving up 0.39% as EUR welcomed the Italian news, GBP approved on the confidence vote win by the PM, and JPY retreated on the earlier risk-on news. CAD was also up, and AUD enjoyed a third day of gains. Gold was up $3 in line but Oil faded after the EIA Stock miss at 1530. Some good news in bonds as well, the 2/10 yield curve widened by 3bp, as the shorter note was flat. Markets turned today, and all equity indices (except Italy’s MIB, for reasons stated above) posted red candles, as US-China optimism faded as it often does when the mercurial President’s tweets are not followed through with any official statement. Also depressing the market was the lowered growth and inflation forecasts from ECB President Draghi at 1330. The subsequent Euro fade was matched by rally in GBP as Theresa May held on to her job. There is no more optimism about Brexit, but if she had lost the confidence vote of her own MPs, the danger is that she would lose one from the opposition, forcing a general election so close to Brexit day. Despite the turn in stocks, JPY continued its downward slide, but with a flat CAD, the net result of the EUR and GBP moves was also a flat DXY. Gold slid $3. Rumours of Saudi cuts meant Oil erased the EIA losses, and more, and closed 3.5% up on the day. A constant stream of economic release misses today (China Retail Sales at 0200, German/Eurozone and US PMIs, US Capacity/Production at 1415) accelerated the downtrend. SPX lost 1.79% and DJIA soften by 2.06%, over 500 points in a 24-hour marubozu, although volume was low. The DJIA underperformance was attributed to Dow stalwart JNJ losing 10% after reports that it knew its baby powder contained asbestos. No particular news item, just a drip-drip of negative sentiment. World indices followed suit. DXY was up 0.35% today, touching 97.71, its highest point since June 2017, after the Retail Sales Control Group beat, the only bright spot in today’s data, but more to do with a depressed EUR and GBP for reasons stated above, and JPY was alone in currencies in posting a green day, in line with the risk off sentiment in equities. Gold and Oil were down in line with the stronger dollar, and the 10-year yield was down 3bp, and the 2/10 gap narrowed by 1bp. A miserable end to a miserable week. Another negative week for SPX, although European indices recovered slightly, as did NIFTY. USD was up across the board, with DXY adding 0.73%, and NZD just pipping GBP as the weakest currency. FAANGS were mixed with a strong recovery from FB, but otherwise fairly flat performance. Cryptos continued their downward slide. 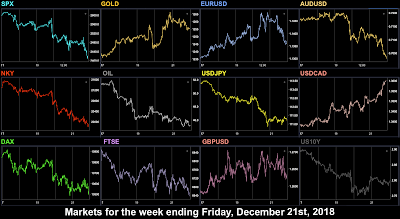 As we move into the final week before the Christmas break, expect lower volumes as traders prepare for the break. This does not necessarily mean lower volatility, as we saw on Friday, when the DJIA 500 point drop was made on very low volume. At any time this week, the results of the investigation into US auto tariffs should report, which in turn will affect tariffs going forward. Markets are closed in South Africa. There is a major speech by Chinese President Xi today make the 40th anniversary of China’s major reforms. Traders will be watching for any comments about the trade war. There is a rate decision on HUF (hold expected). 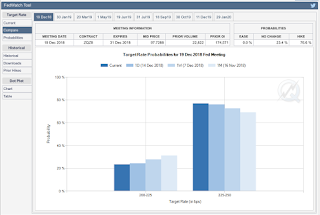 The next rate hike is expected today although the CME Fedwatch tool only puts the likelihood at 75%, a probability that has been falling steadily over the last few weeks as markets fall. President Trump has already said another rate hike would be “foolish”. A failure to raise rates would surely depress USD and raise equities. The EU meets today to consider Italy’s latest budget proposal. The Central Economic Work Conference opens in China, to discuss economic policies for 2019. There is a rate decision on THB (hold expected). There are four rate decisions today, in JPY, GBP (11.9% of DXY), SEK (4.2% of DXY), and CZK, and all expected to be holds. 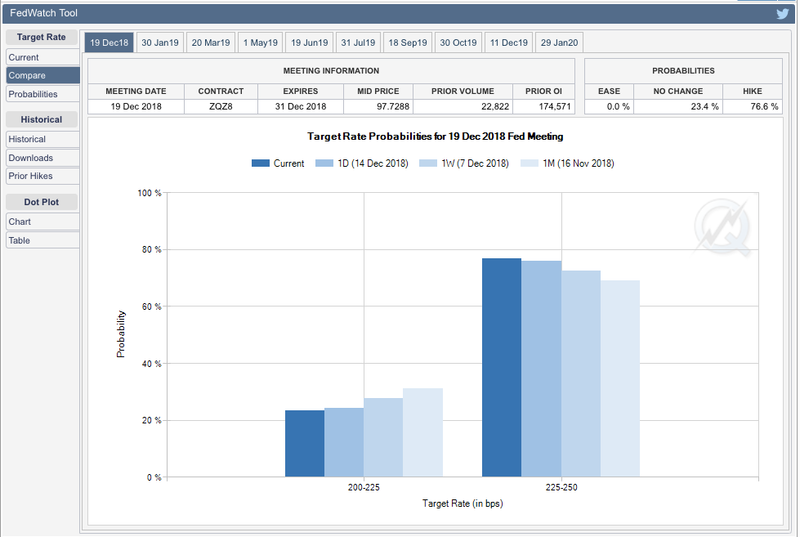 The most important one is the Bank of England decision, and traders will be watching for any downgrade in the Bank’s forward growth (GDP) estimates. The risks to sterling are to the downside. Turning to Japan, there is no outlook report accompanying this decision, so volatility is expected to be limited. Australia’s jobs report is due, and will contain the mix of part-time and full-time jobs, growth in the latter seen as less significant. Today is the government shutdown deadline, which Trump has threatened if he doesn’t get his wall funding, although notably, he has left himself a way out in a recent tweet where he claimed that the new trade agreement effectively paid for it. Interestingly a report is due today on the extent of foreign (read Russian) meddling in the mid-terms. Today is the last full trading day before the Christmas holiday, and some traders may be absent for the rest of the year, so end of year rebalancing and ‘window dressing’ may start today. The GDP and PCE releases are important, particularly the latter as for once, the MoM, QoQ and YoY are all released together (usually, the QoQ is a day earlier than the others). Markets seized on remarks following Trump/Xi meeting at the G20 Conference in Buenos Aires as a softening of the trade war. The US said they would suspend new trade tariffs for 90 days. Equity markets gapped up. The SPX added 1.5%, its largest weekend gap up in 18 years. The gains were however eroded throughout the European and US sessions although all indices still posted a green candle, albeit a doji. The other big news of the day (which also helped equities) was Russia confirming it would co-operate with Saudi Arabia on production cuts. The black gold added 4.82%, its best day since Jun 22nd. Also there were more encouraging reports from Italy about budget compromise, and BTP yields fell. However, around 1800, the US 3-year bond yield fell below that of the 5-year note. Although most focus is on the 2 and 10 year bonds, this inversion was seen as a warning sign by markets. The two times this happened were in 2001 and 2006, shortly before bear markets emerged. This is what quashed what would otherwise have been a very positive day and start to the traditionally strong ‘Santa Rally’ month of December. DXY fell 0.2% on the day. It would have been more except that GBP, after a good start, fell sharply on concerns that British PM May will not get her Brexit deal through Parliament. All other currencies were up (JPY was nearly flat, being pulled between risk-on equity strength and the weaker dollar). Gold was up and 10-year yields were down in line with the weaker dollar. Other indices also fell hard, but the FTSE fell the least, due to a fall in GBP after the British government was found in contempt of Parliament for not publishing Brexit legal advice (which confirmed that the EU had sole control of the ‘’backstop’ exit). This was after an earlier rise like the day before. There was similar pattern in EUR (also affected by Brexit of course), and CAD and AUD were also down, but a sharp 0.8% appreciation in JPY as equities fell left DXY more or less flat. Oil was slightly down, and Gold slightly up in line with JPY. 10-year yields fell sharply, in line with the short-term inversions, giving up 8bp on the day. US equity and bond markets were closed today for the funeral of President GHW Bush. The day’s economic releases were also postponed, and SPX futures actually managed a small gain. DAX was flat on the reduced volume, and FTSE was slightly down as GBP rose after the ECJ confirmation that Brexit could be reversed by a simple withdrawal of the Article 50 notice, meaning ‘no Brexit’ is actually possible. Needless to say this is along way from a Brexit softening, and for the third day in a row, a spike up faded. DXY was flat again today, with advances in EUR and GBP being balance by a weaker JPY and a sharp drop in CAD to an 18-month low on dovish remarks (no inflation, no rate hikes) from the BoC following the rate hold at 15:00. The loonie instantly spiked down 100 pips (0.77%). AUD (not part of DXY) was also sharply down after the substantial miss (2.8% vs 3.3%) on GDP. Gold was flat, and Oil managed a small 0.6% advance, with price action similar to Tuesday. The bond markets were closed. Today the CFO (and daughter of the CEO) of controversial Chinese comms vendor Huawei was arrested in Canada under US orders on potential Iran sanctions violations, causing semiconductor ETF SOXX to gap down 2.8%, although it later partly recovered. SPX gapped down 1.35%. All indices followed a similar pattern, recovering but still ending the day in the red. At the cash close, DAX, FTSE and STOXX were over 3% down, at two-year lows. STOXX had its worst day since June 2016. There was a slight improvement in the yield curve, 2 year paper fell 5bp, whereas the 10 year bellwether only fell by 4bp, which may have mitigated the US losses. Another sentiment factor was the US trade balance print came in as a miss (-$55.5Bn vs -$54.9Bn). This release is not normally significant, but the figure was marginally worse that the Feb 18 print ($54.9Bn), before the trade war started, and thus the worst imbalance since the 2008 crisis. The implication of course is that Trump’s tariffs were supposed to narrow the trade gap, yet it has been getting worse every month since May this year. We finally saw some dollar movement today, with DXY down 0.23% after a strong showing from EUR and GBP, following rises in German and British bond prices, and of course JPY in line with equity fade. Risk currency AUD however was down for a second day. EMs also suffered with ZAR, RUB and BRL notably down. Oil also fell (2.3%) despite the EIA beat at 15:30, but Gold was flat, as was CAD, holding yesterday’s move (despite misses on Trade Balance and Ivey PMI) in anticipation of the simultaneous US/Canadian NFP reports. The relief today in the Oil market which leapt 4.85% on OPEC cuts confirmation was short-lived, and it ended the day a mere 0.81% up. The equity sentiment was dampened further by reports from Trump advisor Navarro (remember him, the China hawk) saying the US would definitely push ahead with the tariff increased if Washington and Beijing could not agree a truce in the 90-day period mentioned above. The 10yr/2yr bond yield narrowed by 2bp, as the shorter note faded 4bp. Then to add to this, US NFP missed at 155k vs 205k estimated, although the AHE figure, which we have said many times is more important, printed in line with the estimate of 3.1% YoY (reminder: US YoY CPI is 2.1%). As you would expect markets fell substantially, with SPX giving up 2.3% to post its worst week since March, and its worst December Friday since 1932. AAPL filled the May gap, and moved into negative territory for the year as did DJIA. DAX and NKY followed suit downward, with only FTSE trimming losses to 0.35% on weaker GBP and stronger Oil. DXY was down 1% on the day, as EUR advanced despite the Eurozone GDP miss at 10:00 (of course Eurozone stats are usually priced in, as the individual countries report beforehand). GBP followed the pattern it has done all week, only this time the fade of the rally took an extra day. These near-100 pip moves in sterling are related to the constant flow of good and bad Brexit news, more pronounced since BoE Governor Carney firmly linked the rate hike path to the degree of soft or hard exit. JPY and CAD hardly moved, but the winner of the day was CAD, which fully retraced (as it often does) Wednesday’s fall after the stellar jobs report (94.1k vs 11k, 850% over estimate, and equivalent to 847k in US terms, adjusting for population). Canadian unemployment also beat, and CAD instantly reversed the 100 pips it (instantly) lost on Wednesday. It was helped also by the Oil move, but being a risk currency like AUD, there are still pressures against it. This kind of move happens a lot with USDCAD and there is not usually a stop-hunting reverse spike, nor is there a quick reversal, which makes this event very easy to trade. Gold was up $11 (0.88%) in line with both the weaker dollar and a week of risk off, to finish at a five-month high of $1,248. On Saturday, China released a stellar trade balance beat ($44.74Bn vs $34Bn est), a new 2018 high. 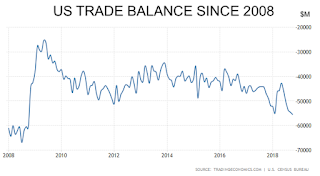 The trade balance has been increasing steadily over the last five months. Taken together with the US decline over this period, it makes you wonder how effective the Trump tariffs are. No Santa Rally yet! After last week’s brief respite, markets continued their slide down, with NKY the worst performer. 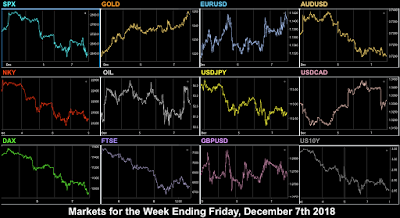 A much quieter week for USD saw both gains and losses (The strong Euro resulted in a 0.43% softening of DXY). Selling AUDJPY would have netted you 2.16%. Cryptos continued to plunge to new 15-month lows. NDX gave up 4.76%, and some of the FAANGs did even worse. Outside cryptos, shorting NFLX (which still has a PE ratio of 69.3) was the best trade of the week. There may be some GBP movement following Sunday’s Brexit debate between British PM May and opposition leader Corbyn. The formal election of Annegret Kamp-Karrenbauer to replace Angela Merkel as CDU party leader takes place. The UK GDP print will probably be ignored as all GBP traders care about at the moment is Brexit. 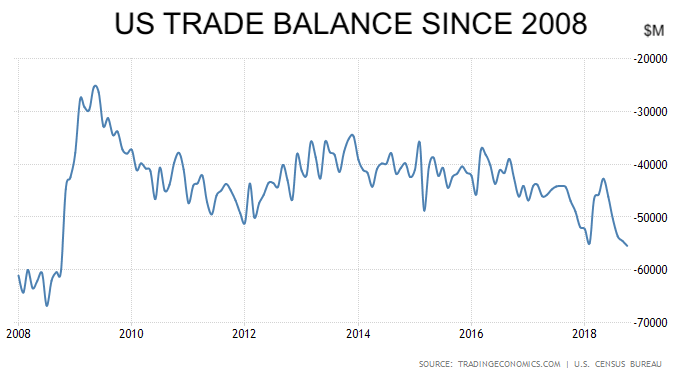 There is also Chinese trade balance data released at weekend. 07:00 EUR Germany Current Account n.s.a. All eyes on the UK today for the crucial Parliamentary vote on Brexit around 1900. The British Conservative government, you will remember do not have an overall majority after the disastrous June 2017 election, and it is widely expected their motion to pass the current plan will fail (a surprise win would boost GBP hugely). This could lead to PM May resigning (to be replaced by a hard Brexiteer? ), a successful vote of no confidence and subsequent snap election, or a second referendum, which in turn does or doesn’t have ‘cancel Brexit’ as an option. All options will have a strong effect on markets. The US CPI print at 1330 is the most important release of the day. A slight uptick is expected, but anything to the downside could affect next week’s anticipated hike, and therefore USD pricing. The Fedwatch likelihood of next week’s hike is already down to 71% from 82.7% on Nov 30th, so a hold is a definite possibility. There are also CPI report from Sweden, India, and South Africa, and rate decisions on PHP and BRL. Mexican markets are closed. Back to Europe today for German inflation and then the all-important ECB statement at 1245 followed by the usual press conference 45 minutes later. This month is when the bank is due to end its three-year €2,600Bn QE. Commentators are however leaning towards a dovish rhetoric from ECB President Draghi. There are rate decisions on TRY, PHP and PEN. The US retail sales figures today are less important, as this print is a CPI proxy, and the actual inflation figure was published two days earlier. Today is the last session of the US Senate in 2018. ECB Lautenschläger speaks at 0930. There is a rate decision in Russia, a 25bp hike is expected. Turkey is due to get a new Fitch rating today.